The car’s loaded, and you’re all packed. Three changes of clothes, an overnight bag, road trip snacks and your camera. It’s time. Time to hit the road and head west to visit two small cities that are big on arts and culture: Alpine and Marfa. While driving west on highway 90 toward Alpine, you’ll notice cities and towns getting smaller and smaller. Eventually, nestled perfectly between the Davis and Glass mountains, you’ll arrive at Alpine. First, you’ll want to drop your luggage at a hotel. We recommend the Holland Hotel, a building that may look unassuming from the outside, but is filled with art, animals and a luxurious lobby inside, making it feel like a museum unto its own. Once you’re settled and out onto the streets of Alpine, stretch your legs with a Historic Walking Tour - a mapped out walking path purposefully guiding you to boutiques, art galleries, restaurants, food trucks, murals and more. For food, check out Cow Dog, an all-beef hot dog joint that serves up some dogs that are masterpieces in their own right, with the wing sauce-smothered “Wing” Dog and grilled pineapple-topped “El Pastor” varieties waiting to be scarfed. To see some of Alpine’s natural side, hit the links at the Alpine Country Club. This nine-hole course has some breathtaking views of the surrounding mountain ranges, plus it’s a great opportunity to work on your short game. If golf isn’t your thing, you can also hike up Hancock Hill behind Sul Ross State University and check out some of the same views. Hey, remember that camera you packed? Make sure you have the lens cap off for this. 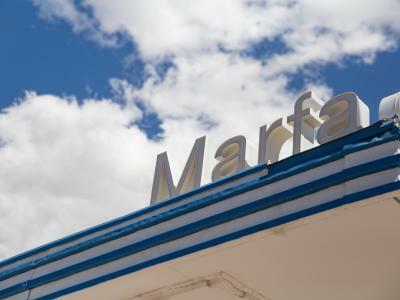 About 30 miles west of Alpine, you’ll come across another quaint little gem of a town called Marfa. Marfa is widely known for its art scene and is recognized by the state as a designated cultural and arts district. The art movement started with Donald Judd, a minimalist artist from New York City. He moved to Marfa in 1971 and began leaving his mark immediately. He purchased two large hangars and plenty of other buildings in the city to display his art, and since then the buildings have been used to house some of the most interesting contemporary art in the country. Judd passed away in 1994, but his movement continues to this day. The Chinati Foundation opened in 1986 and has since been used as a dedication to Judd and his contemporary style. The collection now hosts over a dozen artists whose art will make you want to hop back in the car the following weekend just to look at again. Another well-known phenomenon is the Marfa Lights. Despite there being no artist behind these other than Mother Nature herself, the lights attract visitors from all over the country. The Marfa Lights only appear every so often and at night. To stay awake and alert for the potential light viewing, we suggest stopping by Big Bend Coffee Roasters for a cup of joe before the potential light show. The lights are said to be the size of basketballs and of various colors. They appear to move throughout the night, sometimes rapidly, almost as if they’re dancing in mid-air. There’s still no explanation for the Marfa Lights. Some say they’re UFOs and other people think it’s just someone out there with flashlights and drones. However, one thing’s for sure: it’s something you’ll remember for the rest of your life. That is, if you see them. So whether you end up falling in love with one or both of these cities, there’s really just one thing left you have to ask yourself: What are you up to this weekend?